Here we go! Osmeña Peak! 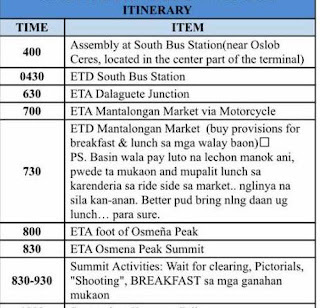 This trip was organized by the members of our church and I was glad to be part of this summit activity. I would like to say my heartfelt thanks to our CCF Dgroup leaders and members for making this event possible. The Osmeña Peak, also known as O’Peak, is the highest peak in Cebu. It ranges up to 1,000 meters above sea level. These corrugated hills were named in honor of a famous political clan in Cebu. This mountain is situated in the province of Dalaguete, the southern part of Cebu. Dalaguete has a total land area of 15,496 hectares (38,290 acres) which consist of 33 barangays including the Mantalungon barangay. There are multiple jagged hills in the vicinity of Mantalungon and one of the popular mountain ranges in this place is the Osmeña peak. The mountain barangays are cold and Mantalongon is considered the “Little Baguio of Cebu”. Average daytime temperatures except in mountainous region range from 22.2 to 32.1 °C (72.0 to 89.8 °F). Humidity is 77%. The place is commonly known as the prime area of vegetable production in the province. You can see various vegetables grown here even from the foothills of the mountain. The people who organised this event had prepared our itinerary for the trip. You may wish to have a plan like this for time management. Some words in our itinerary were written in our vernacular language. We reached the junction section where we have to ride a motorcycle to bring us to the foot of Osmeña Peak. The time was too close estimated in our itinerary. And so we just arrived at the foothill of this peak. Quite a bit cold here and as you notice there were children in this picture. Some of these children were here to ask if you want a tour guide on your way to up to this mountain. This was the foothill of the mountain where we began our trekking adventure. It was past 7 o’clock in the morning when we arrived at the starting point. You have to pay 20 pesos for the entrance fee. This is me and my sister in the picture below at the back of the mountain. The mountain we are going to climb is hidden behind those fog above us. This is just another part of the group, the Group three and each of group has an acting leader to guide us on this trek. This is the foothill of the mountain peak. We were still waiting for the rest to arrive so we can have a general huddle before we start our hike to this mountain peak. We belong to group three (3). Huddle is very essential if you go on a trekking in order to discuss the pros and cons. Everyone must walk together with their groups and no one should be left behind. Let’s the trekking begin! My sister and my friends stopped for a moment for a pose. On the next page, I was amazed by the rigid mountains I saw in my surroundings. The plan was actually trekking in Osmeña Peak then traversing to Kawasan Falls in Badian. I will have to write another blog of our traverse to Kawasan Falls as it was a long journey for us all and a lot of things were happening during that time. What a beautiful view to start my day! Tatal and my for a pose! The group was too large including some of our other friends and relatives who came with us on this trip. In order to control the crowd, the leaders decided to split up the people into three groups, each guided by someone who would act as our leader to look after us on the journey. Our leader is the one behind us, the last one to make sure no one is left behind. Trekking to Osmeña peak would take about 1 1/2 to 2 hours before you reach the summit depending on how fast you hike and how many breaks you take. The peak is at the back of that bulgy mountain. I am nearly there I just a need a little more push on my legs.